The small village of Ocotlán, near Oaxaca, Mexico is the birthplace of Mexico's beloved artist and philanthropist, Rodolfo Morales. The monastery, which had been taken over by the government for its use, was purchased by the Morales Foundation and beautifully restored by local workers to house a museum. 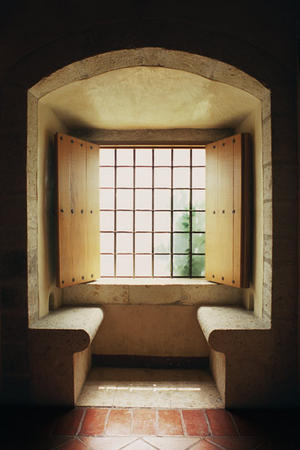 This photograph of a window seat is not only a place where one could imagine having a conversation with a good friend, but for me, the shape of the image is reminiscent of a human head. It represents the private conversations that we have with ourselves, with some aspect of wisdom lurking with allure behind the translucent window panes - always there, but not always as clear as we'd hope. The title, “Tête-à-Tête,” is French for "head to head" and translates in English as an intimate conversation between two people.